Cycle far off the beaten path in Buenos Aires with a 4-hour bike tour of the city’s best graffiti and street art. 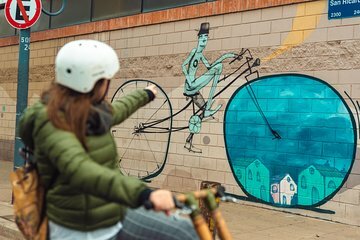 Pedal through the backstreets and alleys of the historic San Telmo, La Boca, and Barracas neighborhoods, stopping to admire vibrant murals and explore the city’s evolution into one of the world’s urban art capitals at local design cooperatives and cafes. Make your way to the San Telmo neighborhood, one of the city’s oldest, to meet your guide in the early afternoon. Get an orientation to your bike, urban riding tips, and an overview of route highlights before pedaling south to La Boca, a historically Italian and working-class neighborhood best known as the home of the Boca Juniors football club and for its brightly painted buildings. Along the way, stop to see murals by creative collectives like Red Sudakas and Triangulo Dorado and get the inside scoop on Argentinian street art. Continue on through backstreets and bustling thoroughfares to reach the Barracas neighborhood. Here you can feast your eyes on the detailed mosaics of Pasaje Lanin and the world’s largest street mural, a masterwork by artist Alfredo Segatori that spans three buildings. You’ll also see a collaborative mural representing the Styles Street Art Convention and works by local artists like Pum Pum, Mart, Pol Corona, and Martin Ron. Next, explore hotspots of Buenos Aires’s contemporary design district, including the innovative Metropolitan Design Center and the Cooperativa Vieytes, a collective housed in a former ice cream factory and decorated with a symbolic mural. Throughout the 4-hour tour, make about eight stops and take breaks to wander by foot, sip the favorite local drink yerba mate, and snap photos of all the fantastic street art. Back at the departure point in San Telmo, drop off your bike and get some parting tips from your guide on things to do and explore while in Buenos Aires. Please note: This tour requires a good level of comfort with biking in an urban setting and venturing into non-touristy areas. Wonderful informative and “off the usual tourist pathway” half day bike tour of some iconic Buenos Aires street art in the inner south suburbs. Definitely worth doing if you enjoy street / contemporary art. AMAZING! If I had missed this bike tour, I would have missed an amazing side of the city. We felt safe with our guide strolling through all sections of the city. We learned so much about graffiti and artists we now recognize the importance and beauty of it all over the world. Highly recommended.